"This salad recipe is great for summer picnics. It's delicious, quick, and easy to make. You can substitute the variety of beans in this recipe with other types and still have a great bean salad. I sometimes use cannellini beans in place of the green beans and it still tastes great!" I love this is the summer or for a pot luck. I do vary it a bit. I add yellow wax beans and use a red onion and green pepper. 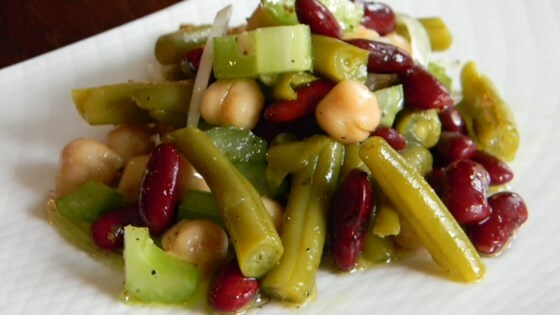 The celery is a good addition to Three Bean Salad. Hubby is our Bean Salad expert around here and he said these were too oily for him & needed more sugar and vinegar. Loved this recipe! Substituted kidney beans for black beans though. Taste is great and everyone loved it! Perfect for summer.